Following the release of video footage revealing the shockingly cruel conditions on French farms that supply Fortnum & Mason’s foie gras distributor, Sir Roger Moore is calling on Emiratis not to shop at the new store in Dubai until the company stops selling foie gras. In a brand-new advert released in Arabic, the former James Bond actor says, “Force-Feeding Birds to Produce Foie Gras Is Cruel. Don’t Buy It”. 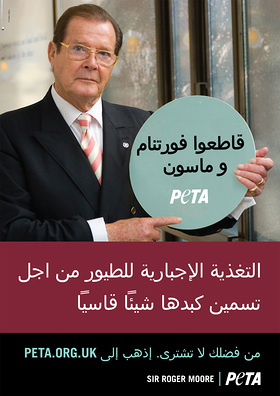 In a separate statement released through People for the Ethical Treatment of Animals (PETA), Sir Roger goes on to urge all Emiratis not to be taken in by Fortnum & Mason’s claim to be quintessentially English, when it sells a product that is so vile that it is illegal to produce in the UK. PETA’s investigation revealed that terrified geese panted constantly as a result of their distended livers, which pressed against their lungs. At the abattoir, the birds kicked and struggled to lift their heads after a knife had been plunged into their throats. They had not been stunned first – contrary to French and British animal welfare laws. Birds raised for foie gras are force-fed huge amounts of grain three or four times every day via a metal pipe that is rammed down their throats. Their livers swell to up to 10 times their normal size, resulting in a disease known as “hepatic steatosis”. Foie gras production is banned in the UK and 16 other countries, which is why Fortnum & Mason shamefully pays French farmers to force-feed geese on its behalf before importing the diseased livers into the UK to sell in its Piccadilly store. 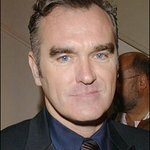 Sir Roger is one of many prominent British figures – including Dame Vera Lynn, Twiggy, Ricky Gervais, Joanna Lumley and Kate Winslet – who have supported PETA’s campaign against foie gras. Here is the full text of Sir Roger’s statement: "I do hope the good people of Dubai will not be taken in by Fortnum & Mason’s scurrilous claim that “Englishness” characterises its products. In fact, Fortnum & Mason is widely condemned and boycotted in Britain as one of the last department stores that still sells foie gras – a product so cruel that it is illegal to produce both there and in more than a dozen other countries. The store shamefully circumvents British animal-welfare law by paying workers in France to force-feed terrified geese via metal pipes until their livers become distended and diseased. An investigation by PETA into the foie gras farms from which the store’s distributor obtains foie gras found that the birds are being kept in the most appalling conditions. The great and the good in England – including the Houses of Parliament, Wimbledon, Lord’s Cricket Ground, the BAFTA Awards and His Royal Highness Prince Charles – all refuse to serve this “torture in a tin”. I invite compassionate Dubai shoppers to join us in calling on Fortnum & Mason to end its involvement in the barbaric force-feeding of birds for foie gras." For more information and to view the video footage, please click here.